← But what good did he do? 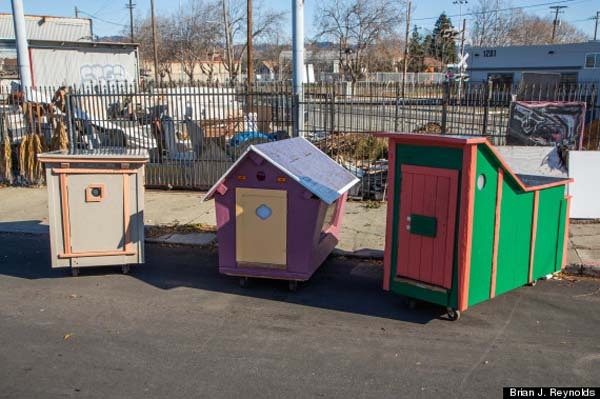 It seems like on almost a weekly basis I get an email, Facebook message, or Twitter link from someone thoughtful who says, “Hey Abe, did you see this?” What then follows is a link to a story about building mini homes for the homeless. And there are a lot of these going on, almost all from the U.S. This one promoted by someone pretty big in the homeless serving community. And there are many others. It seems that the mini homes for the homeless is a pretty popular movement. And I get where they are coming from with this. If the idea is that homelessness is about lack of shelter, and we need quick solutions for shelters, then giving away tents, cardboard boxes, or building wooden boxes is a form of solution. The problem is we’ve been here before, it was before the mid 1960’s, and they were called slums. The infographic idea actually sets up the issue very well, it speaks to the growth in need, how homelessness is very much about poverty and the inability to meet basic needs, and contains all kind of neat ideas to integrate such as environmental sustainability and food security. My issue with all of these is not the intent, it’s that we can and we are doing better in addressing homelessness. As I mentioned recently, addressing homelessness is about ending homelessness. Crappy little homes is not what we envision when we envision ending homelessness, it is just a shift of people into nouveau-hip slums with prettier colours. Instead, we have the resources, expertise, and motivation to truly move all people into a dignified, adequate, and affordable home. It is going to take some work, but lets not reduce the quality of our vision for the sake of expediency. It’s nice to have a vision but the vision I see is the city of London kicking people out of emergency shelters and on to the street. The city of London has no intention of moving the majority of homeless people into a dignified, adequate and affordable home which they don’t have to do but I ask the tough question why do all the homeless people in housing first programs deserve housing over the other homeless? When the city forces the homeless in London out of shelters to sleep outside these crappy little homes will seem like a pretty good idea. What if the whole system was housing first, not just a program for some people. Would that be more palatable?